Our Navy Crochet Maxi Dress with 3/4 Sleeves is perfect! Perfect for any special occasion! We love its beautiful flowy skirt and crochet detail! 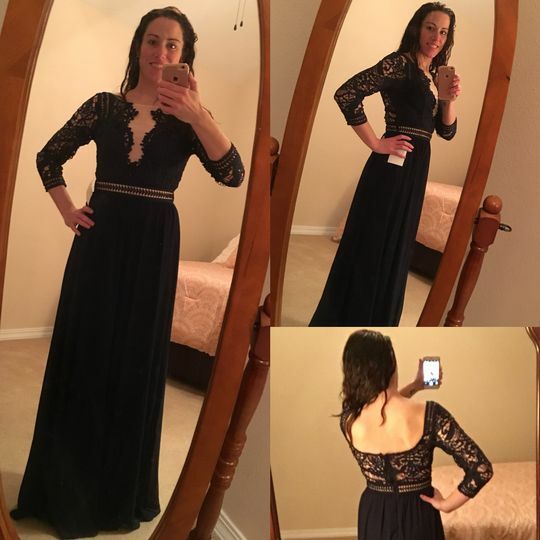 I needed a dress for a winter wedding. I knew I wanted something long and with some sleeves. I came across this dress and immediately fell in love. I ordered a small. It fits great everywhere except it is a little snug near the bottom of my rib cage. Unfortunately I never quite fit into one size category and if I would have preferred a medium it would have been way too big. Overall, I am very pleased with my purchase and can not wait to wear it! Delivery was super fast also! I love this dress! So pretty and it fit pretty good! It was a little long but I tolerated it because I didn’t have time to get it tailored. Thank you for a stunning well made dress!